Gets better every year if possible. Thank you very much. Peace and serenity. Thanks, everything was delightful, accommodation, food and especially gracious reception and guidance about local hikes and thing do to. This is the best place we’ve stayed so far in Scotland. Sheryl and Rick Erickson, Minneapolis, USA. Great hospitality. Beautiful view, nice breakfast. We enjoyed our stay. Dennis and Christine Andersen, Copenhagen, Denmark. 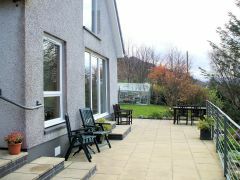 Gairloch View Guest House has separate guest accommodation which is presented to a very high standard earning us a 4-star rating from VisitScotland. Please follow the links below for more photos. 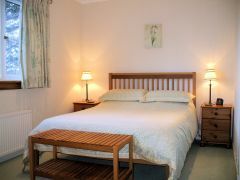 We have 3 guest bedrooms, 2 of which have double beds whilst the third has twin beds. All 3 guest bedrooms are en-suite and have tea and coffee making facilities. 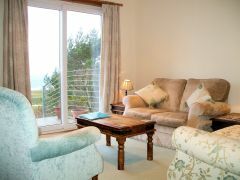 There is a separate guest breakfast room and guest lounge, both of which have large windows giving superb views across Loch Gairloch towards the Isle of Skye and the Outer Hebrides. Outside, there is a pleasant terrace area with seating, an excellent place to relax and take in the magnificent sea views.